The Stella project always welcomes new developers, either on a full-time basis or just to fix your favorite bug. Feel free to	email Stephen Anthony if you wish to contribute in any way to the Stella project. The first major hurdle for new developers is setting up a build environment, checking out the code, and in general actually compiling the project for the first time. The following is a description of how to do this for the three major platforms. Stella needs g++ 5 or Clang++ 3.9 (with up-to-date C++14 support), make and SDL2 development libraries installed. ZLib and PNG libraries are optional; Stella will use built-in versions if none are installed system-wide. These packages are likely available through your distribution repository. Consult your specific distribution for an explanation of installing new packages. Other packages may be needed depending on the distribution you use. The best thing to do is try the compile, note any missing packages, and then install them through your distribution repository. This will checkout from the master branch for local modifications. Please see below for instructions on how to contribute changes back to Stella. Note: You may be more familiar with graphical Git clients; these will work fine as well. 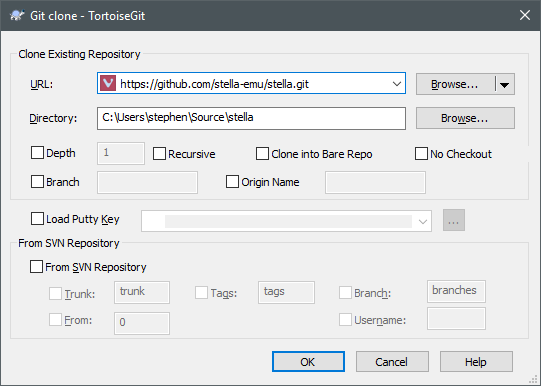 If you'd like to contribute to Stella, create a fork of the repository on github and make your changes there. After you are done, place a pull request against the Stella repository. This process is described in detail in the github docs. and send it to the email address above. Please check out the git documentation on how to select particular commits for diffing. Stella needs Xcode 8 for compilation. You will also need the SDL2 development libraries, located at libsdl.org. You will need to download SDL2-2.0.8.dmg (or newer, if available). The Xcode project is located at src/macos/stella.xcodeproj and is for 64-bit Intel-only machines running 10.7 or greater. Place the SDL.framework bundle (located in the SDL2 dmg file you downloaded earlier) into the /Library/Frameworks directory. Open the project file using Xcode 8. Build the project by pressing Cmd-b, and run by pressing Cmd-r. This will create a DMG installation archive on your desktop. 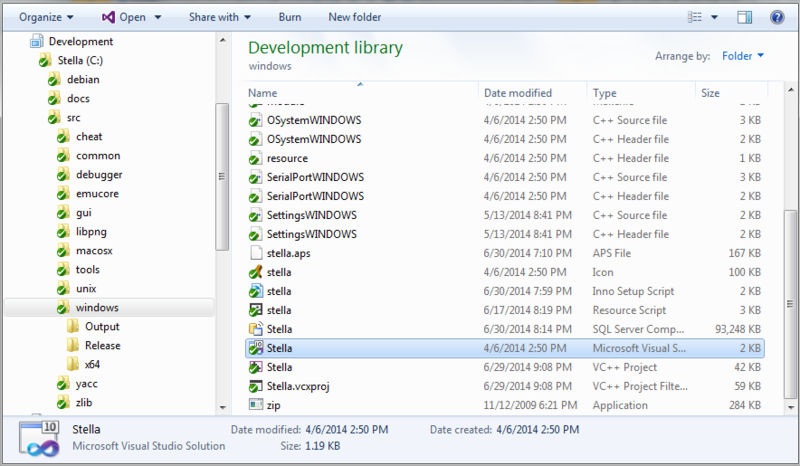 The Stella.app bundle can be copied to your Applications folder, or wherever you like on your system. Stella needs Visual Studio C++ 2017. You will also need the SDL2 development libraries, located at libsdl.org. The version you want will be named SDL2-devel-2.0.x-VC.zip (where 'x' is dependent on the version); download the latest version. You will also need a Git client; the following assumes you are using TortoiseGit. The source for the latest release can always be found under "Stable Releases" on the main webpage. However, you'd be better off working with the most recent code, located in the GitHub repository. To checkout this code, you will need to install TortoiseGit, which you downloaded above. The URL of repository must be the same, but the Checkout directory will be specific to your system. Unzip the SDL2-devel-2.0.x-VC.zip file you downloaded above into this folder. This will create a folder named SDL2-2.0.x (where 'x' depends on the version you downloaded), which should contain, among other things, folders named 'include' and 'lib'. Rename this folder to 'SDL'. In the end, you must have a folder named SDL in src\windows, and the folder must contain 'include' and 'lib' folders as well. Open the Visual Studio project file (Stella.vcxproj) and build the project; it should run to completion, perhaps with some warnings. For the 32-bit version, you have to copy SDL\lib\x86\SDL2.dll into the Release and Debug folders. For the 64-bit version, you have to copy SDL\lib\x64\SDL2.dll into the x64\Release and x64\Debug folders.